Little Tommy Tucker, 432 Centre Rd, Bentleigh 3204. 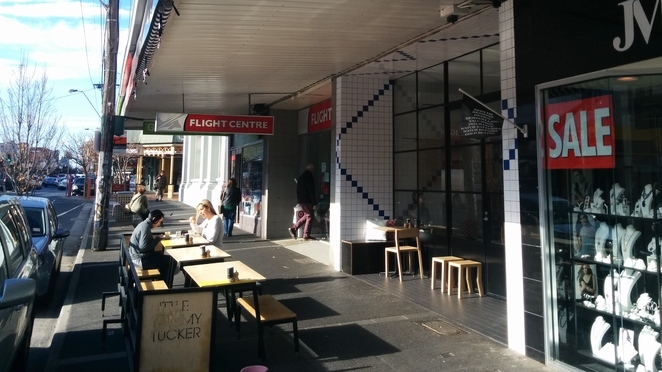 Little Tommy Tucker has fast become a mainstay of the Centre Rd‚ Bentleigh 'coffee strip'. With such fierce competition already about the place it takes a certain boldness to stick your hand up and say 'me too!'. Yet‚ certainly the folks behind LTT know what they're doing‚ and have thrived accordingly. In turn‚ though many cafes and their offerings are worth missing a train for - just like Tax Agent Espresso further South in Patterson Rd, Bentleigh or Minnie Miny Mo Cafe in Moorabbin - LTT's proximity to the station is also a big plus. Its the little things about this place this place good. The wood and black-hued decor that seeks to subtly draw the eye‚ the fact they are a family friendly cafe and welcome prams and young one to the Chai Lattes which are unique in presentation and tasty on the pallets. Alongside the Chai's - and an array of offerings in the coffee and tea department - LTT does a breakfast menu that runs across the whole day. This is great news for those folks that feel toast is a good idea for a breakfast, a wise idea for lunch - but perhaps the best idea for a 3pm snack. Little Tommy Tucker: A cafe that has the goods to keep you coming back on Bentleigh coffee strip. When: 6.30am-4.00pm, 7 days a week.